Wolfpakk are a melodic metal band formed by the hugely talented Michael Voss and Mark Sweeney who invite guest vocalists to join them on their expertly crafted albums. This is their fourth and the third one in a row that I have had the pleasure of reviewing for Ave Noctum – we’re like old friends now! I have to admit though, it’s the hardest I’ve had to review so far, but not because of anything the band have done wrong. It’s rare that I feel the need to criticize a record company (or employees therein), but why the hell would you choose to release an album of melodic metal with guest singers on the same day that a well known melodic metal project with guest singers called Ayreon releases their latest opus? It’s got to hurt sales and cross over with fans in some way – even though they aren’t totally alike musically, people may have to choose between which album they buy. And as a reviewer I’ve had to immerse myself in the 27 hours (as it can seem) of Ayreon’s new one in the same fortnight as poor old Wolfpakk. They deserve better as a band, because Wolfpakk are actually rather splendid! It’s not enough that Wolfpakk in their own right are a top class melodic/power metal band, but that added spice of the guest vocalists sprinkled throughout each release (and the song style leaning itself to that singer’s personal vogue) just gives everything even more interest. This time around we’ve got Biff Byford (Saxon), Ronnie Atkins (Pretty Maids), Michael Vescera (ex-Yngwie Malmsteen), Tony Harnell (TNT), Oliver Hartmann (Avantasia), Jioti Parcharidis (Victory), Steve Grimmett (Grim Reaper), Pasi Rantanen (Thunderstone), Claus Lessmann (Phantom V), Danny Vaughn (Tyketto), Andy Lickford (Lickford) Guesting on guitar there’s Timo Somers (Delain), Brad Gillis (Night Ranger), George Lynch (ex-Dokken), Alen Brentini (A. Gabalier), Jen Majura (Evanescence), Chris Holmes (ex-W.A.S.P.). Bassists on offer are Rudi Sarzo (Ozzy Osbourne), Marc Lynn (Gotthard), Volker Krawczak (Axel Rudi Pell), Michael Müller (Herman Frank) and drums are courtesy of Alex Holzwarth and Gereon Homan. There’s plenty of lupine lyrical lunacy still prowling it’s way all over “Wolves Reign” for all you devout cubs out there, which is part of the experience and also highlights Wolfpakk’s refreshing what-the-hell attitude. This is top class Melodic Metal, but quite wonderfully can’t be categorized like any other specific band – because although the core is the same, each song has a slightly different style thanks to those vocalist invited to guest on it. And every album is different. So yes there are elements of Pretty Maids, Saxon, Thunderstone etc. on here because of the singers involved, but that’s because Voss and Sweeney deliberately put those markers in the songs to bring out perfectly the style of each vocalist. Four albums in and Wolfpakk are just getting better and better with each release, with Voss and Sweeney growing in confidence and bravado. There are so many Melodic Metal styles on here that it’s sometimes like a mouth-watering compilation of these singer’s finest moments. But then the tracks are strong enough to stand up without them – Voss and Sweeney’s vocals are more than fabulous enough to carry the album themselves – the guests just give them the added musical inspiration, gloss and cohesion. I hope there’s cash to spare at the end of this busy month because really if you like classy Melodic Heavy Metal then Wolfpakk should also be on your purchase list. With some consistency, Wolfpakk creators vocalist Mark Sweeney and guitarist Michael Voss have dropped a new album about every two years. Wolves Reign marks their fourth album collaboration. They also stick to their music production formula. They craft the songs and then get a bunch of guest vocalists and musicians to record them. 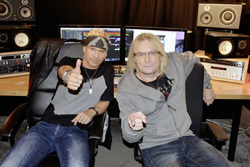 The guest list is a "who's who" of melodic hard rock and heavy metal luminaries from around the world, but mostly from the larger European and UK theater. Notable performers include Biff Byford (Saxon), Ronnie Atkins (Pretty Maids), Mike Vescera (Ex-Malmstenn), Rudy Sarzo (Ozzy Osbourne, Dio), George Lynch (Ex-Dokken), Chris Holmes (Ex-W.A.S.P. ), and Alex Holzwarth (Avantasia, Rhapsody Of Fire). With this PDF, you can see the complete guest list with what they do on which song. So, essentially, Wolves Reign is pretty much more of the same from Voss, Sweeney, and friends, a repeat of Rise Of The Animal. Pick your cliche. "If it ain't broke, don't fix it." Are their any notable differences? Maybe one. I'll get to that in moment. But for the newbie, something should be said of the Wolfpakk musical motif. Largely and mostly, the songs are melodic heavy metal tunes, often with a power metal pace, definitely having a lot of rock groove. Melody and harmony are always at a premium, notable in the brisk sharp riffage and vocal harmonies. As in the past, in most songs, the guest vocalist sings with Sweeney. And it's in the vocal arrangements where there is some difference from the previous record. Within Rise Of The Animal the vocals were largely gnarly and raw. This time around, mostly, they're clean, melodic, and harmonious. There are a two exceptions. In Inside The Animal, Victory vocalist Jioti Parcharidis has a gnarly snarl to his voice, but it fits the timbre of the song. In I'm On To You, Killer vocalist Andy Lickford sounds like he swallowed razors drenched in cheap Kentucky bourbon. Musically, I still liked the song. Fundamentally, I like the direction Wolfpakk started with Rise Of The Animal and continues with Wolves Reign, delivering edgier, more energetic, melodic heavy metal, stuffed with rock groove and infused with AOR accessibility. Top song picks? Definitely, Wolves Reign, Tomorrowland, and No Remorse. For the third time the roaring Wolves are back, the Hard Rock/melodic Metal allstar pack, led by the turbulent duo of vocalists Mark Sweeney (ex CRYSTAL BALL) and Michael Voss (MAD MAX/MSG/CASANOVA), will release the last part of their successful triptych entitled “Rise Of The Animal“ on February 27th. The duet of Alpha Wolves are still working as a perfect creative team with the same focus and the original spirit is still intact: The high-class traditional Heavy sound, their songwriting abilities and their connections in the biz are the main attractive and the obvious common point with each WOLFPAKK releases. Since day one, the concept of this amazing project was to reveal the essential talent of Voss & Sweeney with some high level musical performances, and to let the world knowing it by adding maybe an enlightenment provided by the reputation and the notoriety of the famous guests of players and singers. The talented binomial of Voss / Sweeney wrote all the songs together except for the lubricious hit-single “Sock It To Me” and the title track that was made with the helping hand of Axe player Martin Rauber (he’s also in charge of all the guitars in “High Roller”), they were also responsible for the production and the mixing duties, and of course they performed some ferocious lead vocals in duet or trio with the sublime collaboration of a famous bunch of Metal screamers. This new masterpiece is tremendously polished and carefully produced, after two excellent releases, the main problem is to reach the same degree of perfection, but their commitment for their art and their dedication was decisive in the triumphal result and yes, once again the guest list is vertiginous and expansive to the point of insanity, featuring talented current and former musicians from just about every renowned band in the Hard Rock and Power/Classic Metal genre! Running under the strong wake of their previous remarkable works and the success of their first acclaimed albums, they use the same subtle recipe: A first class Hard Rock choral project influenced by the old nature of the pure Euro Metal sound. The opening track is clearly spawned from their initial method, like a ACCEPT meets PRIEST in a fury of demented drums fills courtesy of the Mohawk Heavy hitter Mike Terrana. This time the whole sound design is more tagged in the 80’s sing along orientation, maybe a little less Germanic than the early albums, even if the pace is keeping its fast tradition, of course some part of the tunes are especially crafted for the guest vocalists, like the chorus of the Sleaze Metal anthem “Monkey On Your Back”, which is clearly designed for the Ted Poley vocal style, the Hair Metal impression is even reinforced by the Guitar solo of CASABLANCA leader Ryan Roxie. One of the highlights is of course the Epic “Highlands” even if I think that the voice of the almighty Joe Lynn Turner is underemployed, the song is clearly a winner! ”we are predators…Against the wind and rain – we carry on” those words are coming from the magnificent and touching “Black Wolf” featuring the hyper-talented Rick Altzi, which is also a very interesting number, the trio of voices is matching perfectly in this pieces that starts with an acoustic intro… The gang backing vocal chorus is particulary efficient… Superbly Heavy; another essential tune! Swedish champion John Norum is giving his six strings maximum, for the very predictable double kick driven cut “Somewhere Beyond” with also the ubiquitous David Reece on Vocals! The next track contains some great performances by Don Dokken & Doug Aldrich and as always some clever arrangements but the best is yet to come. The most outstanding moment of the albums is the epic “Rise Of The Animal”, with the impressive Mr Kiske who provide his typical high flux of ultrasonic pitch yelling, embellished by a fast pace and a dramatic dimension, a melodic power frenzy somewhere between HELLOWEEN and PRIMAL FEAR with a little something from RAGE. At the final slot, the track “Universe” is somewhat ordinary even if the soprano vocals of Miss Michaela Schober are quite good, I can’t connect with the melodic stream and the shift of style! Finally, “Rise Of The Animal” is another chapter for this highly acclaimed project, a perfect sequel for their trilogy ,but it’s not the end… I heard about a fourth episode and who knows maybe one day a live presentation… I wish and pray the gods for this eventuality. If there’s a five here, then there’s usually a good reason for it. I’m not the kind of reviewer who likes to praise everything, and I try to make the most honest opinions about every album I’m handed. But this one really hit home for me. I had no idea who Wolfpakk were until I got a listen of the record and being a fan of classic heavy metal and the power metal genre before the days of the Dragonforce era modernization, I really have to say that there’s really something here for everyone. Not only does this album feature a plethora of vocalists like Amanda Somerville (Kiske/Somerville), Ralf Scheepers (Primal Fear), and Goran Edman (Ex-Yngwie Malmsteen), but it also features guitar licks from Kee Marcello (Ex-Europe) and Mandy Meyer (Krokus, Ex-Gotthard) and others. But that’s not all, because Don Airey (Deep Purple) and the living legend Tony Carey (Rainbow) are on keyboard duties for this one. The band also decided to cover Rainbow’s classic track “Run With The Wolf” with the original keyboardist, which certainly turned out to be a stunning track. Still, skinsmen of the nature of Brian Tichy (Whitesnake/Ozzy) and Hermann Rarebell (Ex-Scorpions) are also featured on the disc among many others, making this one hell of a release. I love collaborations more than anything else out there, and when they’re done to perfection; it makes me feel honored to be able to listen to and review them for the public. If any of these names pop out at you, you can be certain that none of these artists performed a half-baked effort and truly gave it their all. From the strong power metal opener “Moonlight” to the thumping of “Dark Revelation” and “Pressure Down” (which is sure to be in your head for days) as well as the metal anthem “Wakken”, there is more than enough metal content here to get your head banging and your horns raised like it’s the eighties all over again. There’s also a strong ballad called “Cold Winter” for which a video has been filmed. Additionally, a bonus track called “Kid Raw” has been included on the album and it’s also worth checking out.